When it comes to dental patients' cosmetic concerns about their smiles, gaps caused by missing teeth are at the top of the list. Luckily, for this condition, dental implants provide a fixed replacement that doesn’t come loose and restores whole teeth instead of just covering up the visible gaps. Talk to a dentist at Arlington Dental in Arlington, TX, about dental implants—you may learn that you’re a perfect candidate for this tooth-replacement solution! When a tooth is uprooted by injury, dental disease, or a manual extraction, there’s space left in the jawbone for it to be replaced with an implant. An implant is made of titanium, which has proven to be very biocompatible (safe to integrate with healthy bone tissue). As long as the patient has good bone density, the implant will eventually fuse to the jaw and effectively replace the tooth root. The last step of the tooth implantation process is to add a restoration, otherwise known as a dental crown, to the implant. Modern crowns are very lifelike—they look naturally smooth and are colored to match your smile. They’re also made of porcelain, which has many attractive and functional qualities. Your Arlington, TX, dentist will attach the crown with a device called an abutment, and once in place, your dental crown and implant will remain firmly attached for decades. - Before a dental implantation procedure can commence, your dentist must take an x-ray to confirm that you have sufficient bone tissue. - You must be evaluated (if necessary, treated) for gum disease to ensure that the bone tissue isn’t inflamed or degrading. - Your immune system will ideally be strong, to ensure that the implant heals properly. 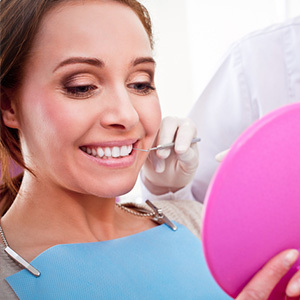 - In order to maintain a dental implant, you must maintain pristine oral hygiene. The process of getting dental implants is straightforward and very worthwhile if you place a high value on the look and function of your smile. Call (817) 303-5700 today to schedule a visit with Dr. Joseph Reed at Arlington Dental in Arlington, TX.